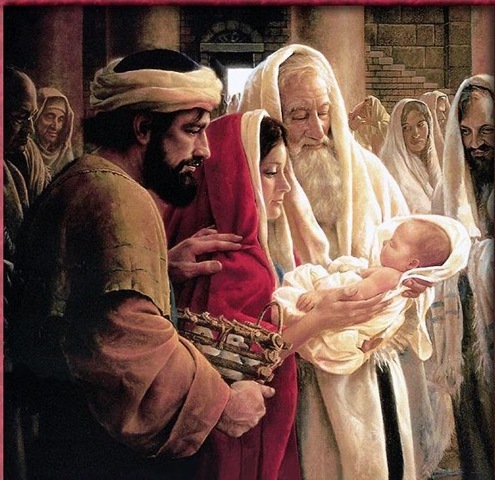 After baby Jesus was born, Joseph and Mary brought Him to the temple to be circumcised according to Moses’ Law. When eight days were completed, Joseph and Mary presented baby Jesus to God. They offered two young pigeons as a sacrifice offering to God. At that time, there was a man called Simeon. Simeon is a faithful and devout follower of God. God promised Simeon that before his death, he will see the Lord Jesus Christ. The Holy Spirit was upon Simeon and it led Simeon to the temple where Joseph, Mary and baby Jesus was. When Joseph and Mary brought baby Jesus into the temple, Simeon was there. When Simeon saw the baby, he felt very happy. He lifted up his arm and praised God. There was a prophetess named Anna who lived at the temple. Anna is a widow of eighty four years old. She had been fasting and praying in the temple day and night. When Anna came into the temple, she saw baby Jesus there and gave thanks to God. Then she talked about Him to all those who are looking forward to the redemption. After Joseph and Mary had done all the things required by the Law for a newborn baby, they returned to their home in Nazareth in Galilee. Jesus became stronger and stronger in spirit and wiser and wiser as He grows up.